A planner, no matter how beautiful, won’t be much help if it isn’t set up for you to make every day your best day. Knowing planner binders and refill sizes means you can successfully set up your own planner and design your day your way! 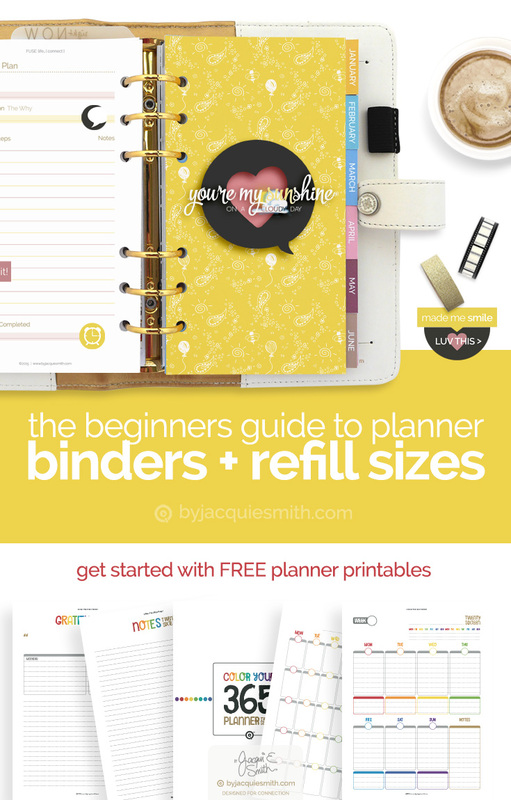 Your planner binders and refill sizes guide … simplified! With the explosion of our love for all things planners comes the challenge of matching your favourite planner binder with page refills. Each company names their sizes differently. A medium at Kikki K isn’t the same as a medium from Filofax. So how do you know what works with what, easily and simply? As a self confessed planner lover and one who thrives on creating planner pages and systems, I have done a heap of research and am please to be able to pull all the information together in this article. 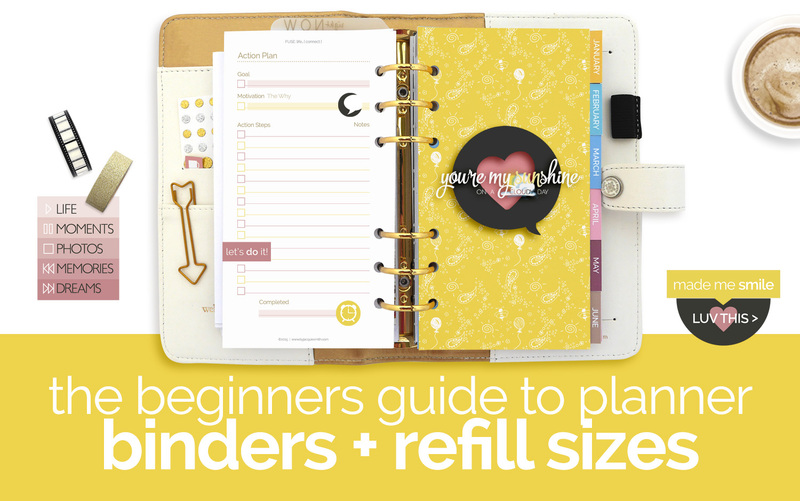 The images below will help you know what size refill inserts will work with a variety of planner binders. Whether your planner stays on your desk or travels with you as your constant companion + most loyal assistant, I have a size that will work for you. My FUSE:life digital planner printables come in three popular sizes while the Colour Your 365 printables are available in large only (at this time). So what are these three popular sizes? I’m glad you asked. One of the most popular questions I am asked is about planner binders and refill sizes so I know the following information will be helpful for you to know what planner binders match your preferred paper size. Let’s take a look at them close up and see what sizes work together. There are two main points to consider choosing your planner size, portability and writing space. How portable you need your planner to be? Does it live on your desk or will you be taking it everywhere you go? How much space do you need for writing on each page? There are options depending on which of these two factors are most important. For example, you can have your preferred planner size for portability and use a double page spread instead of a single page design. Lt’s take a look at which planner binder brands work with the three popular page sizes. Some binders will require a slight modification to the trimming of the pages. There is no standard size when it comes to Personal planner sizes, although many fit very closely to the 95x172mm size of my Personal printable planner pages. My Personal size is based on Websters Pages Color Crush, it is my binder of choice in this size due the quality and affordable prince point, it also comes in an A5 size which we will talk about next. A5 is an international standard page size while the comparable for the US is half letter. Generally it requires no additional trimming when it comes to using this planer size. There may be a slight variance depending if you want to match the exact size of your preferred planner binder. #Tip: While my Medium planner printables are A5 in size, due to the 0.5” margin on all sides you can safely print the half letter size from the same file. #Tip: The Colour Your 365 planner printables are currently only available in the large size. They are designed to fit both A4 and US Letter paper sizes. I created a unique page size and design that works with both paper sizes. They can also be printed at a reduced size, approximately 72%, to fit A5 and Half Letter paper sizes. I know that was a lot of information. Now that you have your binder size you are ready to choose your paper and refill pages. Many people ask what paper is best to use. Rather than give a specific brand I will focus on the weight. The weight of the paper contributes to whether you will have bleed through from your pens. Due to the amount of pens and papers available I can’t give advice on all options available. A great starting point is 32lb or 100gsm paper weight. Try your favourite pens on this weight and you will quickly know whether you prefer a thicker paper or this suits perfectly. If you are printing the Personal planner size, there are often two pdf files supplied for each page design, a single page and another that is what we call ‘2 up’, that is there are two of the same page designs side by side on the one page, with trim marks. You can print the single pdf page on an A5 or half letter paper size or print the 2 up version on either A4 or US letter paper. Both of these options will need to be trimmed afterwards. There are trim marks included that fit the 95x172mm personal size, Webster’s Pages Color Crush and many other personal planner binders as listed above. The Medium pages are supplied as a single page only. While you can fit 2 to a page when printing on A4, you can’t on US Letter. Again this decision came down to keeping it as simple as possible for everyone. For those using the A5 planner size, the easiest way to print your pages is to print directly onto A5 size paper. You can buy A5 paper precut or use a guillotine or paper cutter and cut A4 in half yourself. As I mentioned earlier, the Large planner pages one fits both A4 and US Letter paper sizes. It is also supplied as a single page only. Now that you know the planner binder and refill sizes you are ready to begin setting up your own planner. For tips on printing planner refill pages, see my article, Print Planner Pages in 3 Simple Steps. If you would like to design the flow of your own planner pages with printable refill pages and print double sided, see my article, Make and Print Your Own Custom Planner. Get ready for an awesome + productive day! I’m interested in a new Filofax. I have been using a personal size for years but it’s such a pain to resize pages to print myself. I was thinking of buying the a5 size from Filofax but I was wondering if I could fit my personal pages in the rings. I know they will be smaller but I just want to know if they will fit the rings? Sorry Jennifer I haven’t used a filofax binder so I could say for sure. You may need to contact them directly. Thanks for stopping by. Anyone confirm that personal filofax refill will fit Kate Spade zipper agenda ? Thank you! I have used Color crush since January, but want a smaller ring size personal for my bag. The compact filofax is a choice, but I’m looking at Kate as well! As far as I can tell my personal size refill pages will fit the Kate Spade agenda. Of course I would recommend checking the page dimensions before purchasing. I love your website, it has helped me understand better the difference between A5 and personal planners. Just wanted to ask you, Does A5 and Personal size use the same inserts? Hi Angela 🙂 It depends, some companies call their sizes different names which is why it can be confusing. Simply check the dimensions of your planner binder and the insert file to ensure they match. This is very helpful for ordering inserts. Thank you for the level of detail. I have been a Franklin Covey devotee for years. I have become bored with my ages old binder and am looking for something new and fresher to take to work. My concern is, most of this blog (at least as I am understanding it) relates to paper size, assuming you plan to print your own pages. I am not so ambitious. I usually use a Classic size Franklin planner insert, but know their binder rings and paper punches don’t line up with everyone else’s. I am willing to consider a Monarch, since this would not leave the office…but wonder if Franklin’s unusual hole punch spacing relates to anyone else’s idea of a Full page (or half page in the case of the classic binder) hole punches! Thanks in advance! First thanks for stopping by with your question. yes, I specialise in printable planner kits. The advantage of printing your own pages is that you really can create a planner that is unique to you and suits your style of planning and doing. Sorry I don’t know the exact spaces for each planner binder. you’d need to contact the specific company to ask for their details. Hi. I like to take notes in a medium size planner book (paper 5.5″ x 8.5″; 3 rings), and am looking for paper that I can then transfer to a full size (paper 8.5″ x 11″) 3-ring binder. I would think this is somewhat common, but have not been able to find paper pre-punched so that the holes will line up in both notebooks. I currently have Avery 7-hole punch paper in the medium planner. I was wondering if you have come across this issue/goal before and might have any suggestions. Thank you! Sorry Stuart I haven’t come across that situation before and don’t have any helpful suggestions. Thanks for stopping by. Hi Wynatte you’d need to trim your paper to fit the custom size. Will Franklin Covey 7 ring paper fit into one of the A5 6 ring binders? I know the pages need to be trimmed slightly, but I’m not sure if the paper holes will match up to the rings in Filofax or Simple Stories. Sorry Leah, I’m not sure of the distances between the holes and couldn’t say for certain. You’d best message Filofax or Simple Stories to find out for sure.